This year, Business for Peace has launched an afterwork series with MESH in Oslo. 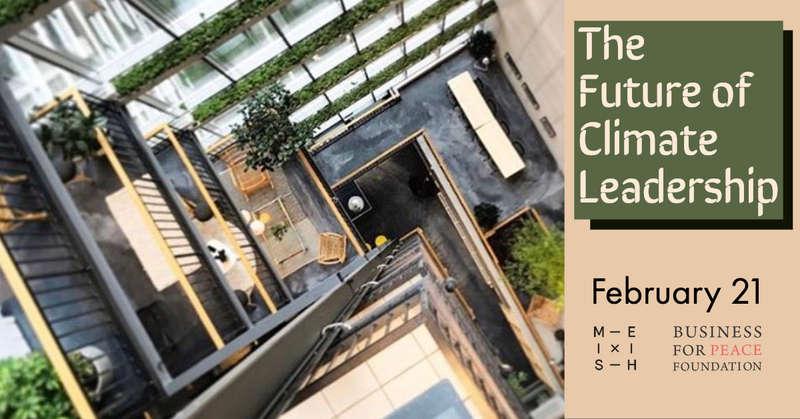 Following our first event, The Future of Cities, we’re happy to announce our second afterwork talk, The Future of Climate Leadership. During this conversation, we will explore what role businesses have to play in shifting the economy to avert impending crises caused by climate change. We will also address how businesses and civil society are working to reduce negative environmental impact and how they plan to take the lead in revolutionising our societies to be part of the solution. Join us 21 February at 18:00 for expert business perspectives from Anders Lennartsson, Sustainability Manager at IKEA Norway and Jan Kristensen, Vice President and Head of Supply Chain Sustainability and Environment/Climate at Telenor Group. Additionally, Karoline Andaur, Deputy CEO of WWF Norway, will join to represent the views of civil society. More speakers to be announced soon. The event is fully booked. If you haven’t gotten a ticket, you can come to MESH at 17:30, prior to the start of the event. We’ll place you on a waitlist and you’ll be let in after ticket holders at 18:00, if space permits. Each speaker will give a brief talk, followed by a Q&A. The bar will be open for mingling afterwards too. If you are not in Oslo, stay tuned to our social media channels for live updates from the event. Anders Lennartsson is working as sustainability manager at IKEA Norway. IKEA has a goal of becoming climate positive and 100% circular in 2030, and Anders is co-leading the transformation towards a more sustainable IKEA Norway together with all 3000+ co-workers. He has extensive experience at IKEA, with sustainability functioning as the green thread. Before coming to Norway three years ago, he held the role of health and sustainability manager for IKEA’s global food business. Jan Kristensen is the Vice President and Head of Supply Chain Sustainability and Environment/Climate at Telenor Group. Over the last ten years, Jan has worked with environmental and climate related issues, with a special focus on how the ICT industry’s technology and smart services, such as the Internet of Things (IoT), has the potential to cut global carbon emissions, reduce the intensive use of resources, stimulate economic growth and deliver substantial social benefits. Karoline Andaur has worked with the World Wildlife Fund since 2009 and is now WWF Norway’s Deputy CEO. She has also previously worked for Norway’s Parliamentary Committee. While in charge of WWF’s business sector work, Karoline and her team explored essential questions, such as how do we achieve the green shift? And how do we reach the United Nations Sustainable Development Goals by 2030? She believes the world faces challenges that demand cooperation across borders and sectors. This entry was posted	on Monday, February 11th, 2019 at 12:53	and is filed under Blog, News. You can follow any responses to this entry through the RSS 2.0 feed. Both comments and pings are currently closed.